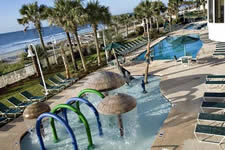 In Myrtle Beach, South Carolina you will discover accommodations to fit every budget. The Grand Strand offers oceanfront hotels and resorts ranging from economical hotel rooms to luxurious and spacious vacation rentals. 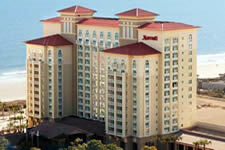 Book your lodging online to SAVE BIG with our Discount Hotel Deals. The luxurious Marriott Myrtle Beach Resort, a AAA 4-Diamond Award Winning Resort, is located on the beachfront in the exclusive Grande Dunes community. Choose a guest room with a resort view or spectacular ocean view. The resort is loaded with amenities including indoor and outdoor pools, hot tubs, a water slide, a full-service spa, fitness center, championship golf, tennis courts, a full-service business center, concierge desk and fine dining. Click for more info. Nestled in the prestigious, 145-acre Kingston Plantation, the Embassy Suites Oceanfront Resort Hotel is a 2012 TripAdvisor Certificate of Excellence Award winner. 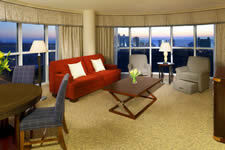 All lodging at the resort consists of luxurious 2 room suites with spectacular views of the beach and Atlantic Ocean. On-site recreational amenities include a water park with exciting slides, nine pools, whirlpools, a huge fitness facility, tennis courts and a seasonal oceanfront bar. Click for more info. 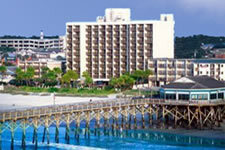 Located on Ocean Boulevard, the oceanfront Hampton Inn & Suites is TripAdvisor's top rated Myrtle Beach hotel. 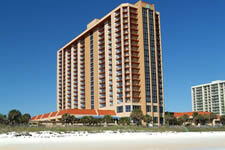 The resort offers ocean view or oceanfront guest rooms and suites with private balconies. Oceanfront 2 Bedroom Suite: Accommodates 8 Guests. On-site amenities include 2 lazy rivers, indoor & outdoor pools, jacuzzis, a kiddie pool, a children's playground, a fitness center overlooking the ocean, a kid's activity program (seasonal), free high-speed internet access and a 24-hr concierge. Click for more info. 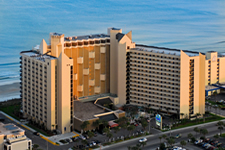 Conveniently located in the heart of Myrtle Beach, the Sheraton Convention Center Hotel is an upscale, full service resort. On-site recreational amenities include an indoor, heated pool with sun deck, a whirlpool and a fitness facility. Visit Vidalia's Restaurant for great Southern cuisine or relax with a cocktail at the M Bar and lounge. The Sheraton offers a complimentary breakfast and afternoon hors d'oeuvres. Click for more info. Situated on the oceanfront just 4 blocks south of the Family Kingdom Amusement Park, Sea Crest Oceanfront Resort offers a selection of ocean view or oceanfront guest rooms, efficiencies and suites with private balconies and free in-room wireless internet. Resort amenities include a fun-filled water park, indoor & outdoor lazy rivers, a children's activity pool, indoor & outdoor pools, 2 indoor jacuzzis, a baby pool, beach bar, oceanfront snack bar and exercise facility. Click for more info. The oceanfront Holiday Inn at the Pavilion is located on the Myrtle Beach Boardwalk just two blocks from the SkyWheel and Plyler Park. In addition to the perfect location for a beach vacation, the resort offers a variety of ocean view or oceanfront rooms, efficiencies and suites. Resort amenities include a wide sandy, beach plus an indoor lazy river, indoor pool & whirlpool, an outdoor pool, kid's activity pool, tropical beach bar and an exercise facility. Click for more info. A family friendly resort, Compass Cove Oceanfront Resort is conveniently located on Ocean Boulevard close to area amusement parks and other attractions. 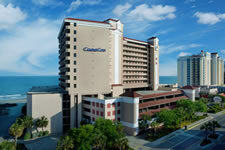 Choose from ocean view or oceanfront guest rooms, efficiencies and suites. In addition to 720 feet of beachfront, Compass Cove amenities include 6 pools, 3 lazy rivers, 2 water slides, a kid's water playground, 5 kiddie pools, 7 hot tubs, a fitness center, summer kid's club, shuffleboard and a game room. Click for more info. Located on the northern end of Ocean Boulevard, the beachfront Ocean Reef Resort offers easy access to Grand Strand attractions. The resort offers guest rooms, efficiencies and suites with magnificent ocean views. Resort amenities include water parks, indoor & outdoor pools, lazy rivers, an oceanfront pool, kiddie pools, an oceanfront lawn, pool side ping-pong, basketball, volleyball, a game room, on-site dining and an oceanfront boardwalk. Click for more info. If you're looking for lodging on the south Grand Strand, these South Myrtle Beach Hotels are great options for your vacation. If you need a hotel on the north end, visit our North Myrtle Beach Hotels & Resorts page for family-friendly, oceanfront resorts and hotels. If you're just looking to save as much money as possible, check out these cheap hotels in Myrtle Beach and all along the Grand Strand! You'll find some of the Best Rates found anywhere on the beach! For beachfront camping in Myrtle Beach with a myriad of amenities, take a look at these Grand Strand campgrounds. In addition to campsites, these oceanfront campgrounds also offer spacious beach houses and villa rentals. If you plan to bring your pet on vacation: Check out these pet-friendly Myrtle Beach hotels. Looking for hotels that rent to 18 and 21 yr olds and up? Head over to our Hotels for 18-21 Year Olds section!